Bass projects ideas for creating an eco-aware future—along with his political views—in his debut novel. Tony, a former solar-panel salesman, discusses the benefits of solar energy—and the disadvantages of its alternative—with his boss and his clients, all of whom become immediately inspired to change their lifestyle and help the cause. At the same time, Gabby, a leader in environmental science, enlightens Mariposa, her young and naïve intern, while attributing the issues faced by the United States government to the Republican Party as a whole. The Pott family, who is “big into oil,” is cast in a negative light, as is Daniel DeLano, a libertarian member of the Conservative Committee, until his solar panels begin to malfunction—that’s where Tony sheds light on the situation. Tony rattles off his knowledge of the solar-energy industry in true adman fashion, without being prompted. 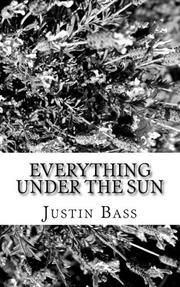 It’s clear that Bass has done his research on the topic of solar energy, and he provides extensive information about how to incorporate renewable energy into one’s life. It’s presented in a dry and didactic manner, however, with very little buildup or character development. Tony is quick to fall into his rehearsed rant to his boss, clients, friends; all of whom serve as unrealistically receptive audiences. In the first 20 pages, the novel tackles such issues as global warming, the weak economy and the Iraq War. While these issues are undoubtedly worth discussing, the resulting narrative reads like a cross between a solar-panel infomercial and a political diatribe. Though the political opinions begin as dialogue between characters, the author’s own opinions seem apparent as the novel continues and quotation marks begin to disappear. A verbose discourse for readers whose political views are in alignment with those of the author.